I find the many color correction tools to be the most useful of the various plug-ins on the market. For me, they become the most often used, because they don’t lock you into a trite look, characteristic of many special effects filters. Noise Industries, whose filters are a cut above the norm, has accrued a nice collection of FxFactory filters that can be used for grading and color correction, thanks to their partnership with developers, such as DV Shade and Luca Visual FX. A recent addition to the fold is PHYX, who has been a developer of plug-ins for Apple Shake. Their association with Noise Industries now brings two powerful tool groups (PHYX Keyer and PHYX Color) to Final Cut Pro, Final Cut Express, Motion and After Effects. PHYX Color is a deceptively simple set of five color correction/grading filters: Bleach Bypass, Glow Dark, Selective Saturation, Shift/Suppress and Techni2Strip. The names might imply a one-trick pony, but that’s hardly the case. 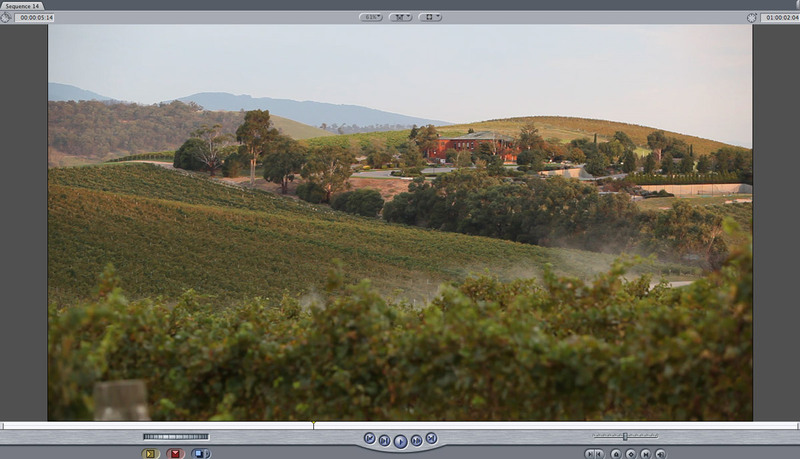 I’ve pulled a sample frame from a recent Canon 5D project I posted for DeBortoli Wines. This frame is of their lovely Yarra Valley, Australia winery estate. The image is as it came from the camera – in other words, I haven’t done any correction to it prior to applying these filters. The look of the Technicolor process came back into vogue with The Aviator and a few filter sets include a plug-in similar to this. Techni2Strip attempts to authentically simulate the process of photographing through green and red filters and offers two methods. Above is an example of Method A, which offers the most control and is supposed to be the most accurate simulation of the process. In general, adjustments shift the image between being more yellow or more cyan. Here’s an example of Method B, which offers less control and according to PHYX is a less authentic simulation. This filter is analogous to using a colored gel in either an additive or subtractive process. Shift (seen above) moves the colors in an image towards the selected color. In this example, teal. When set to Suppress, the selected color is removed from the image. Here, I’ve selected a blue, which is then pulled out or suppressed as a component of the foliage, hills and sky in this shot. Selective Saturation is a similar effect to Suppress but uses a different sampling technique. More of a specific color is removed and it is a better filter if you are trying to isolate a specific color. In this example, I sampled the darker vineyard area and desaturated it. This left saturation in the main building and hills in the background. This filter diffuses the darker area of the image. It is intended to be used on very crisp, synthetic images – like computer-generated scenes – and make them look more “real”. The diffusion removes the harshness of edges. Its use shouldn’t be limited to CGI, however. In this first example, you can see that an extreme setting gives you a very diffused look for a more dream-like result. This second example with different settings yields a different result entirely. Note how the ridge in the middle of this scene feels almost three-dimensionally offset from the distant hills in the background. A bleach bypass filter has been a staple of many effects packages since the look first cropped back up in Three Kings and Savings Private Ryan. This one gives you an authentic look, which characteristically is desaturated, high contrast and has blown-out highlights. Unlike many others, PHYX Bleach Bypass can also be useful as a general grading filter and doesn’t need to result in the typical “skip bleach” look. Above, I’ve set it to have a very hyper-real, colorful appearance. This second example is more like what you expect to see when you think of the look of a “bleach bypass” or “skip-bleach” or “ENR” process. Like any filter in Final Cut Studio or After Effects, you don’t need to stop at just one! Often you get the best result when you stack up a few to establish a “look”. In the following examples, I’ve applied four PHYX Color filters (Bleach Bypass, Glow Dark, Suppress and Shift) to the image, which is shown neutral above. First, I’ve applied Bleach Bypass and cranked up the settings for a very punchy result. Second, Glow Dark adds some diffusion. Third, I’ve used Suppress to pull some of the lushness out of the green of the foliage. Fourth, I’ve used Shift to add an overall peach-color tint to the image. For the past few posts I’ve been looking at a number of new plug-ins and applications designed to augment an editor’s toolset. I’m going to round off this “Plug-in Summer” with a fresh look at FxFactory. Noise Industries was one of the first developers to leverage the power of Apple’s Core Image technology for real-time filter application – first with Factory Tools for Avid (AVX) and then FxFactory for Apple’s FxPlug architecture. They found the most success with FCP editors and have focused primarily on FxFactory, but current versions of Factory Tools can still be purchased for Avid systems. FxFactory operates with the three primary FxPlug hosts (Final Cut Express, Final Cut Pro and Motion), as well as Adobe After Effects CS3 and CS4. It actually installs as two components – the FxFactory filter management application and a package of plug-ins. The FxFactory application isn’t used to apply filters. Instead, this is where you control license registrations, hide filters you don’t want to use and disable trial versions. It also provides one place to get a quick visual overview and access to user instructions for all the effects. Last but not least, adventurous editors can use this as a portal for Apple’s Quartz Composer in order to develop their own custom plug-ins. That’s a unique part of FxFactory not offered by any other plug-in developer. Noise Industries has developed their business through a partnership with various plug-in developers, who design specific filters to work with the FxFaxtory engine. These developers currently include idustrial revolution, yanobox, Boinx Software, SUGARfx, Futurismo Zugakousaku, DVShade and, of course, Noise Industries itself. In its most basic form, FxFactory is a free download. This means that you get the FxFactory application, a few free plug-ins and 15-day trial versions of the other filter packages. This is a great way to get started, because if you only care to buy the yanobox Motype title animation generator or the DVShade color correction EasyLooks filter, then that’s all you have to pay for. If you want a more comprehensive package, then get FxFactory Pro, which includes over 140 filters, generators and transitions, as well as the other trial packages. You also get a free 15-day trial period with the Pro package. This partnership arrangement is an interesting aspect of the Noise Industries approach. Most plug-in vendors develop their filters with an in-house programming staff, resulting in a similar style and focus to the plug-ins that are developed. Since FxFactory plug-ins come from a variety of different programmers – each with a different vision of what they’d like to create – the total sum of filters provides more diverse choices than the competition. For instance, there are lots of glow filters on the market, but I’ve rarely seen anything as organic as idustrial revolution’s Volumetrix 2 package. FxFaxtory didn’t include particle effects until idustrial revolution came out with ParticleMetrix and Boinx Software was added as a partner. Now there are two of the most gorgeous particle packages under the same umbrella. Much of this expansion has happened in the past year, giving you a lot to choose from in 2009. For instance, Final Cut Pro 7 will introduce alpha transitions, but idustrial revolution has been there for at least a year or more with SupaWipe. The new Final Cut Studio package will drop LiveType, so if you don’t want to do the effects in Motion 4 (or an older version of LiveType), yanobox Motype is a good alternative. Motype offers a wealth of presets with tons of customization so you can create very graceful title animations, all within a single track and single application of an effects generator. Remember, all of this installs into the Final Cut Studio apps, as well as After Effects, so editors who like to do their heavy lifting in After Effects can maintain filter compatibility. It’s hard to cover the whole breadth of what’s possible with these effects in one single post. A relative newcomer is DVShade, whose EasyLooks provides FxFactory with a color corrector. This filter is deceptively simple, because it shows up as a single filter in the palette. Nevertheless, it includes a slider-based 3-way corrector, diffusion, gradient and vignette tools and a ton of preset looks. Unlike other 3-ways, target colors selected for the low/gamma/high color wells are used to tint those color ranges in an additive or subtractive fashion. This approach yields some interesting results. Like all the Noise Industries filters, if you are confused about its use, simply click on the logo at the top of the filter control pane to launch a PDF help guide. In the past year, Noise Industries has added a number of video tutorials to its website to further improve the customer experience. As you look through the many options for filters, generators and transitions, it’s hard to decide which product is the best, if you assume that you only can purchase one package. Noise Industries offers some diverse and powerful options, but remember that it’s not “all or nothing”. Many companies are breaking down their comprehensive packages into smaller sets of filters. That’s great for the user – allowing you to get color correction filters from Company A, titling tools from Company B, keyers from Company C and so on. It’s a model that Noise Industries helped to start and one that let users customize their ideal working environment.